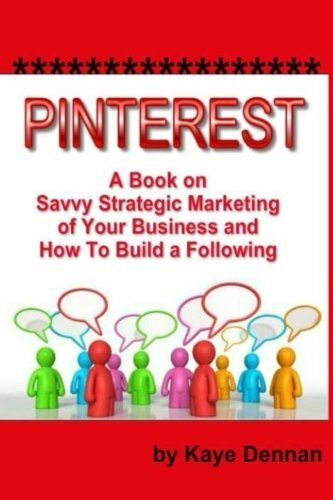 “Pinterest: a book on savvy strategic marketing of your business and how to build a following” is one book that you need if you are not already a master of the Pinterest social site. Pinterest as a marketing tool for business owners has become a force to be reckoned with. The fact that a pinner can quickly pin images from their own computer, from their website or in fact any other page they have open on the computer, makes Pinerest one of the easiest ways to share business information and links. Pinterest for business has proven to be exceptionally powerful and now that there are such techniques as the use of Rich Pins to create sales Pinterest will keep on attracting more and more businesses and the buying market. If you have not set up your business account then don’t wait any longer, learn how to set it up and maximize it to get more and more traffic to your website. Once your visitors are at your website you can sell them or collect them names for your database. Get on board now, become a savvy Pinterest user, learn the killer strategies and start building your own community. When you have read this book I would love you to leave a comment because these comments help other readers and also help me to stay motivated to share my experience with many more books I have in mind!! Thanks….